Anyone know the street price? I have the old DR100, the locking XLR's is also a nice upgrade. Their cardiod mikes direction is already the same as on Zoom. Anyone had try this? Is it big improvement from the old model? Premium AKM Audio4Pro™ A/D converters with over 100dB signal to noise ratio"
"S/N Ratio	92dB or more（XLR LINE 1 IN→LINE OUT, Fs44.1kHz, +24dBu input, JEITA）"
Wouldn't the original DR-100 be better in noise then? Because it looks like the A/D converter is better in the original just going from the specs? Was looking at getting the DR-100.. 4 channels would be awesome though. 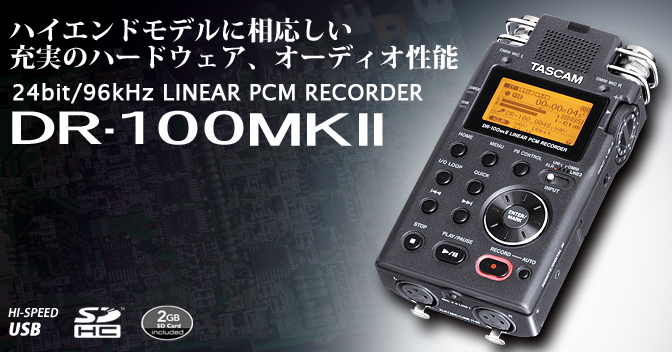 But B&H says its a 2 channel recorder, not 4.
edit: Another section of the page says "The section AD / DA will use the electronics IC ※ Asahi Audio4pro ™ brand beyond the S / N 100dB", so looks promising. All recorders use good AD converters. Problem lies in microphone preamps. DR100 have low gain and quite noise preamp. Thanks for the heads up Vitaliy! I really like the Tascam DR100 when I need a mic-xlr-DR100-padded cable-DSLR signal chain for dual sound. I will likely be picking up this new version when it comes out. This is a great list of recorders by Signal/Noise Ratios http://www.avisoft.com/recordertests.htm some surprise performers in there like the Sony PCM-M10 and Roland R09HR. @phenixone > it doesn't have 4 track. Dispite not beeing 4 channel, I still have hopes for this recorder. But what do you guys think of pairing this DR100 mk2 with a Røde NTG 3 shotgun? The NTG3 must have phantom power, and in my limited experience with the first DR100, using Phantom seemed to drain the batteries pretty fast. On the Roland R-26 it's possible to specify phantom on/off indicidually on the two XLR inputs. I hope this is possible on the DR100 mk2, because the other XLR will connect to a Sennheiser G3 (doesn't need phantom). ... Does it seem like a reasonable sound setup for documentary production? I get about 3 to 4 hours off phantom power. That's pretty good. Batteries are cheap too. @brianluce wow. Is that with included (Li-Ion) battery? Or combined with both Li-Ion and AA batteries? Any opinions on using the NTG 3 mic with Tascam DR100/DR100 mk2? I am in the market for a field recorder and am very interested in this unit. Any one have any experience with the DR100mk2 yet? It sells for $299us at Sweetwater, 2 year warranty and free shipping. The Roland R26 sells for $499, 2 year warranty free shipping. The Tascam is a 2 stereo track recorder the Roland is 6 track, 3 stereo. I currently have the MK11. Can say that it is a VERY good unit. The pre-amps are VERY clean, and the unit is very well made. Personally I use this for NTG3, and also for recording line out of theatre / music shows. Works very well on both occasions. You have the new olympus LS-100 in between the Tascam and the roland r26. It seems to be quite good for $ 400. Could be except it supposedly only captures 2 channels at a time. It cannot record both XLR audio signals and the built-in condenser mic signals at the same time. You talking about the Olympus...? I am aware of this limitation with the MKII. Yes. The Olympus LS100. I have not confirmed this as yet. Tascam's literature suggests the DR100MkII can record from both the internal mics in stereo and the XLR/Line inputs at the same time either in stereo with 2 mics or mono fed to both channels. Is this so? The Roland R26 can record to 6 mono channels or 3 stereo according to their add literature. All 4 internals and the XLR/Lines simultaneously. I will report more info on the Olympus as it becomes available. The DR-100mkii has a major selling point which hasn't been mentioned: S/PDIF input. Prior to the DR-100mkii, the most affordable digital recorder with an S/PDIF input was the Marantz PMD661, which retails for double the price of the Tascam at $600. Although 2-track recording may be a significant limitation (2 channels are fine for my needs), I think the ability to receive external digital signals outweighs it. I plan to connect a Sound Devices USBPre2 with my DR-100mkii via S/PDIF output, which should allow for degradation-free recording at $950 total (Tascam - $300, SD - $650).